That's better ! Lets try for three this time. Still refusing five pix at once, so I'll try for two. Pix are the usual size that I post on here without problems, usually around 800/900K each. Four times I 've tried to post this together with five demolition photos, each time being told that it is not possible to display the page - so I'll try & post it as text only. If successful I'll try & post the photos in another post. 29/7 - internal demolition has been taking place for a few days. Currently the facade & outer walls are intact but it is not known whether these are to be retained. Has any work been recently carried out (since the scaffolding has been taken down), or are there any plans to renovate the building to any of your knowledge?? I trust that we are all well on here!!! Just wanted to see if anybody had heard any news re the Granada/ABC/Images, everything seems to of gone incredibly quiet!!! Has anbody heard any news regarding the building, or, has anybody been inside in recent years and fancies a chat to perhaps fill me in with the condition of the building in more detail??? Thanks for sharing this Johnwb, the pics on Ebay are great!! Do you have any other items from the Granada at all?? I bought all the microphones from the Dover Cinema about 30 years ago! I'm selling one of the microphones on ebay if anyone wants to see a photograph of what they were like. A very attractive art deco design. If anyone is interested the microphone is listed under "RCA Varacoustic ribbon velocity microphone LMI-6203-C from Granada Cinema Dover" . I understand that the building is on the proposed route for the olympic torch. The owners of the building have been told to spruce up the cinema before the torch relay. I have heard that as well, I hope that something positive will happen with the building soon rather than falling into an even worse state!!! Does anybody know if anyone been inside in recent years???? The scaffolding has been up for sometime now, does anybody have any idea what is going on with the building?????????????????? I hear that bits have been falling off the building, so the scaffolding was put up to protect the public... It could be there for some time! I wonder what happened to the original speaker system. The one at the Odeon Cinema in Canterbury was enormous but very efficient. I understand that it only needed around 20 watts to fill the cinema with sound. From what I recall - it had a massive folded bass enclosure with a multi-horn mid/top speaker. I would guess there was similar at the Granada Dover. 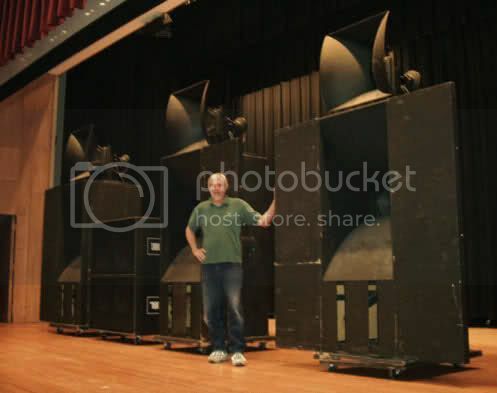 Found a photo of some old cinema speakers similar to the one at Canterbury Odeon. Just one unit would fill the cinema with a very full and rich sound - very distinctive - particularly on deep male voice overs etc. What was so amazing was that they were fitted with just ONE 15" bass driver plus the horn on top!! I would love to have a couple of these enclosures if only I had somewhere to use them. Right, been digging around, when the cinema closed in the 80's the then projectionist removed all the projection equipment but not sure about the sound equipment. These speaker units fitted with modern drivers and amps would make superb club systems - certainly not portable if the one in the old Canterbury Odeon is anything to go by. I have sent out a couple of emails about the sound system and will report back.